By selecting and extracting specific quotations and arranging them in particular sequences, Lord throws light on texts that have often been restricted to theological and academic study. Through this exposure, she reveals their relevance to the Arts today, showing how their content can stimulate an enhanced awareness of truth, beauty and knowledge in our lives. 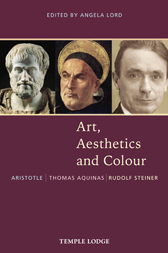 Art Aesthetics and Colour also offers us the opportunity to reinterpret the works of Aristotle and Thomas Aquinas in the light of Rudolf Steiner’s contemporary spiritual-scientific insights. In addition to the extensive quotations from the three historical figures, Lord provides brief biographies, an introduction, notes and a bibliography. The book is well-illustrated throughout and includes colour plates. ANGELA LORD is a painter, interior colour designer, muralist and art educator. Born in Christchurch, New Zealand, she studied with Gerard Wagner at the Goetheanum Painting School in Dornach, Switzerland. She founded the Columbine Art Academy in Sussex and London, which offers a diploma recognized by the Arts Section at the Goetheanum, and she teaches around the world, most recently in China and Beirut. Her publications include The Archetypal Plant: Rudolf Steiner’s Watercolour Painting; Easter: Rudolf Steiner’s Watercolour Painting; New Life – Mother and Child, Rudolf Steiner’s Madonna Painting; Colour Dynamics, and three books on Creative Form Drawing.